See Philadelphia's Polish-American coloratura soprano, **MARIKA SZCZEPEK**, in concert on June 5 at ballroom of the beautiful Associated Polish Home of Philadelphia! 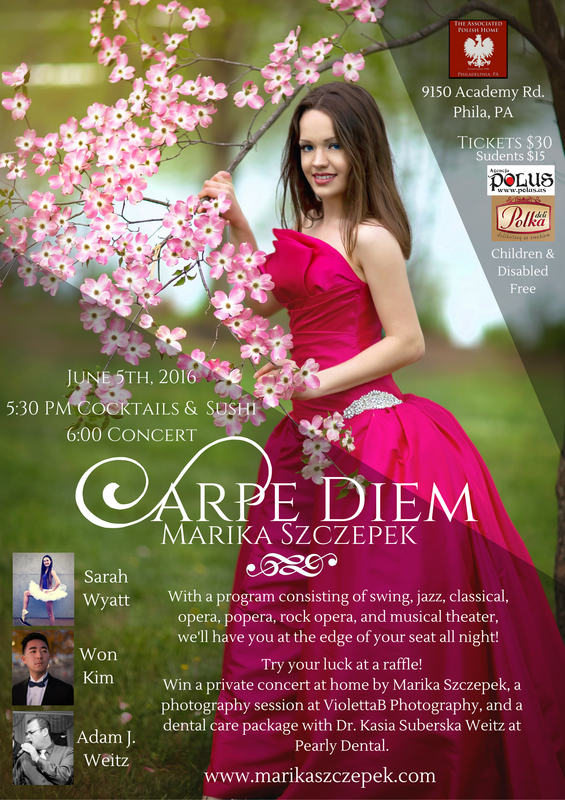 Marika's "CARPE DIEM" concert is a follow-up to her popular 2015 "Suoni Dell'Anima" concert, and will feature performances of favorite hits from today's pop music, broadway shows and famous operas. You'll enjoy gorgeous costumes and astounding special effects! *This is a fundraising concert!! * All proceeds benefit Marika's efforts to pursue advanced levels of musical education. You can feel GREAT knowing that your ticket purchase is supporting an excellent cause! The evening starts with a cocktail hour at 5:30 PM, featuring drinks designed especially for the event! You'll also be able to try your luck in lotteries for a private concert by Marika Szczepek, Soprano at your home for friends and family, a dental package prepared by Dr. Kasia Suberska Weitz at Pearly Whites, and a photography session at ViolettaB. Photography.